The Alhambra Theatre has been a part of the Jacksonville landscape since the late 1960s, offering a dinner theatre experience that in the case of so many other theatres, has rarely has withstood the test of time. Quality has come and gone from the Alhambra, and come back again making it the gem so many wanted it to be. Prior to 2009, the Alhambra had been in decline for years. It was dirty, the food was bad, and the whole experience left patrons feeling taken. The Alhambra was set to close and native Jacksonvillians everywhere were nostalgic for the school field trips of days gone by to see plays at the Alhambra. Fortunately there were a couple of local residents who had the vision and resources to rescue the Alhambra from its fate and rebirth it into the lauded showpiece it is today. There are ten shows produced each year at the Alhambra, including the annual holiday show and summer family show, along with single evening concerts and special events. Chef Dejaun Roy takes inspiration from each show to come up with a corresponding menu. The old buffet has long been banished from the Alhambra and guests now experience table service, choosing from a menu of two appetizers, four entrees, and two desserts, including vegetarian and gluten free options. 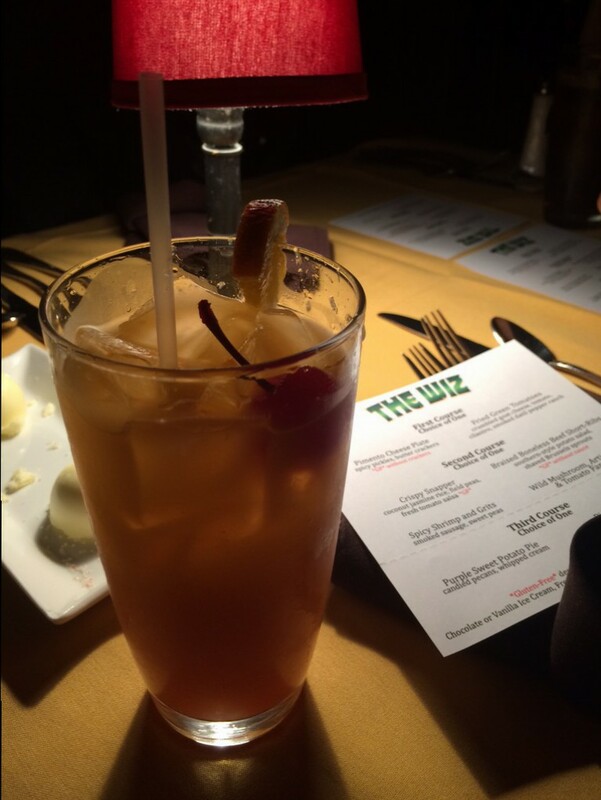 We recently saw The Wiz at the Alhambra right before the end of its month-long sold out run. The menu included first course options of a Pimento Cheese Plate with spicy pickles and butter crackers or Fried Green Tomatoes with crumbled goat cheese, tomato, cilantro, smoked datil pepper ranch, on a bed of field greens. Second course options were Crispy Snapper, coconut Jasmine rice, field peas, and fresh tomato, or Braised Boneless Beef Short-Ribs, southern style potato salad, shaved brussel sprouts, or Spicy Shrimp and Grits, smoked sausage, sweet peas, or Wild Mushroom, Artichoke, and Tomato Farro. Third course options were Purple Sweet Potato Pie, candied pecans, whipped cream, or Pistachio Cake. The only dishes we did not try were the snapper and the farro. 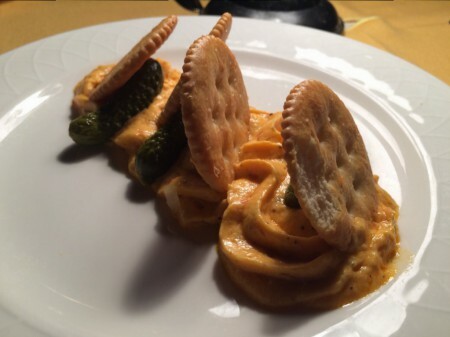 The first course of Pimento Cheese was delightful and fun. Who doesn’t love pimento cheese and crackers? This house made pimento cheese was far superior to your usual grocery store variety. It had just the right amount of salty, smoky flavor. The Fried Green Tomato dish was exceptionally well done. They were nice and crisp, not soggy, which seems to be the most common problem for fried green tomatoes. 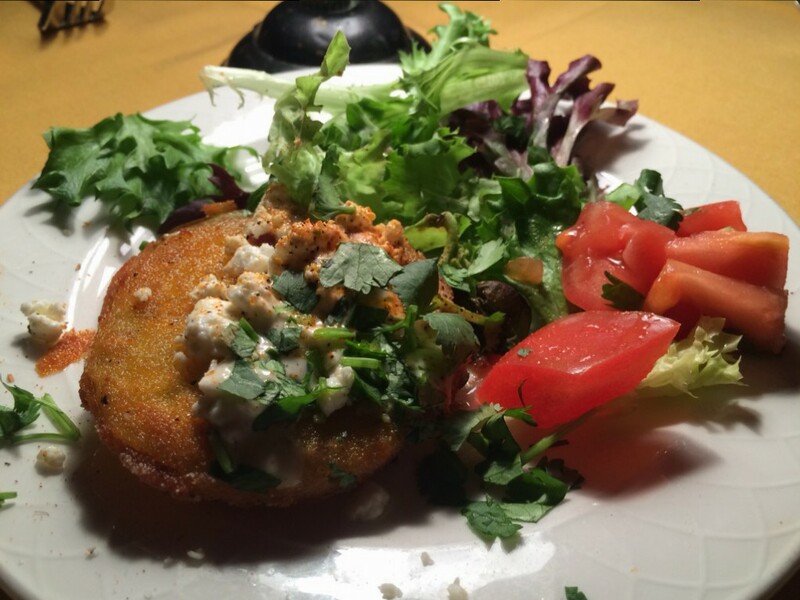 The goat cheese and datil pepper ranch dressed the fried green tomatoes perfectly. 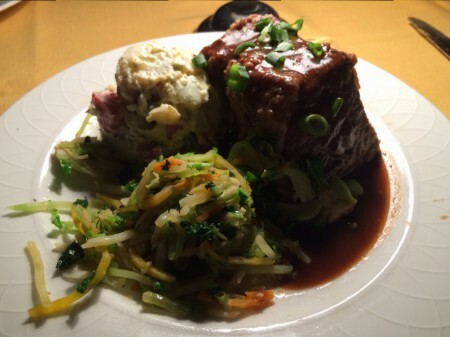 The second course of Braised Boneless Beef Short-Ribs was probably the star of the show. As a non-lover of potato salad I nearly chose a different dish, but I wanted the meat and hoped it would be worth it. I was not disappointed. The short rib was tender and juicy with loads of flavor. Even the potato salad was really good and I do not like potato salad. The shaved brussel sprouts were a surprising boon to the dish. Again, they weren’t soggy, they were crisp-tender and nicely salty and buttery. 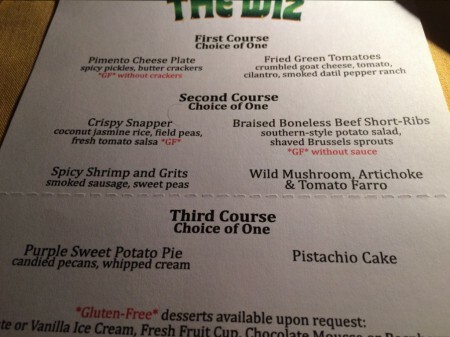 The Shrimp and Grits were not as spicy as we expected. They hardly had any spice at all. They did have plenty of flavor, though. The sweet shrimp and smoky sausage were plentiful. The peas were fresh. The sauce was zesty. Both entrees we chose were generous in size and well prepared and plated. 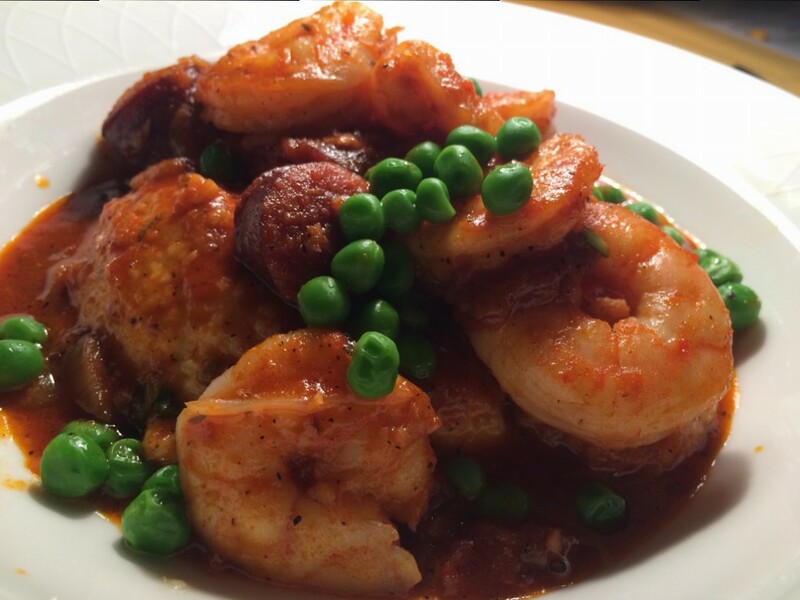 Remarkably these are some of the best shrimp and grits we’ve had in Jax! The third courses were the least gratifying. 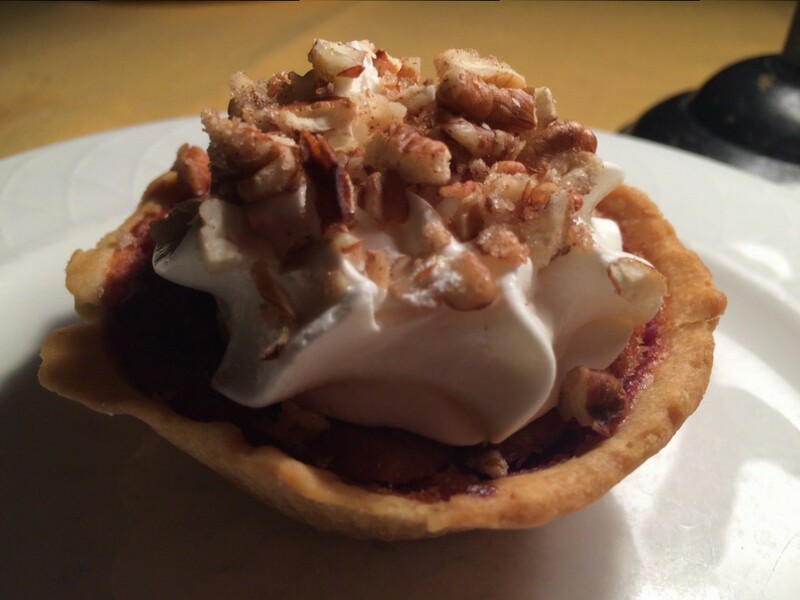 The Purple Sweet Potato Pie was presented beautifully in its own tart-sized pie shell. It was not the best sweet potato pie of our lives, but it was pretty good. The candied pecans were just lightly candied. The pistachio cake was a slice of bundt cake with whipped cream. 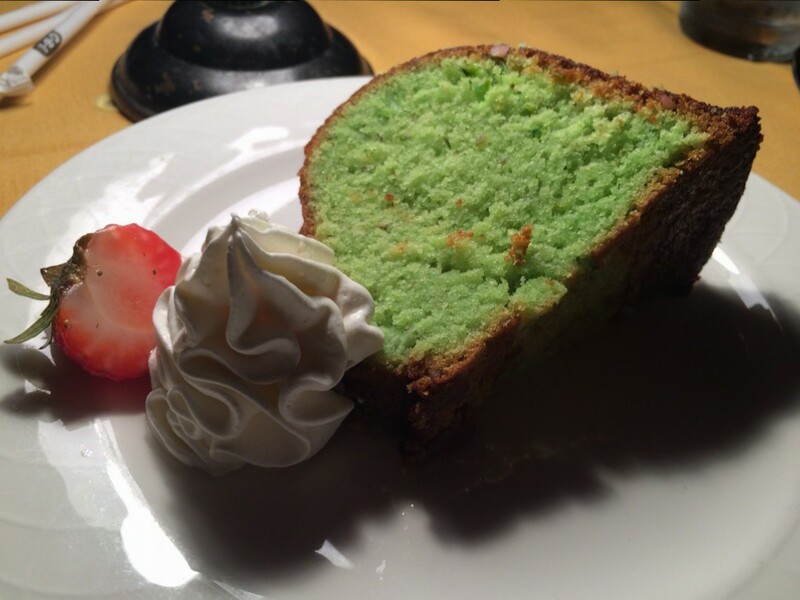 The cake had been dyed green which is customary for pistachio flavored anything and was a playful wink to the play. There is a flavor that almond extract leaves in baked goods that is unappetizing to me and this cake had that same flavor. It was disappointing to end my meal on that note, but it had been enjoyable otherwise. The Alhambra experience just begins with the meal. Doors open two hours prior to the show with the goal of meal service ending half an hour before curtain time. If you want to hang out at the bar and socialize, it makes sense to get there when doors open. But realistically it takes about an hour to be seated, order, and eat all three courses. We intended to give ourselves just about an hour and a half for dinner, but ended up getting to the Alhambra with almost exactly an hour to go before the show. It was probably less than ideal for the staff; they were definitely working at full clip, playing whack-a-mole in each section as courses were coming out of the kitchen, guests were being seated, and the clock was ticking. They did it well and with a service-minded attitude – it’s just sort of the nature of feeding a few hundred people in an hour and a half. Our preference is to get there an hour and a half before the show. Our experience has been that amount of time neither drags nor feels rushed. The last plates are cleared, coffee is served, and drinks are topped off in the last half hour before the show while birthdays and anniversaries are announced and celebrated. During intermission, checks are delivered and paid, and a handy chart shows various tipping percentages based on the meal portion of your ticket. After the show, actors head to the lobby to meet guests and take pictures. The entire staff lines up and greets every guest as they leave, thanking them for coming. From top to bottom, the Alhambra works to ensure an enjoyable experience for every guest. They are glad you are there and joining in their vision for theater in Jacksonville. The Alhambra Dinner Theatre truly is a jewel, and an unlikely one at that. As one of the few remaining dinner theaters in the country, the Alhambra should have crashed and burned long ago. It very nearly did. But as hopeful and hardworking hands took hold of it, the Alhambra became what we had always wanted it to be. You can check out the rest of the 2016 show schedule and book your tickets at their website. We go to two or three shows each year and have never seen a bad show. Tagged Dinner Theatre, Entertainment, Full Bar, Takes Reservations. Bookmark the permalink. I saw the Wiz at the Alhambra as well! I LOVE going. We bought season tickets this year and are enjoying the shows. I LOVE live theatre and musicals. Whenever we go to a show we need to eat anyway so might as well do both. I heard that the chef is going to be on guys grocery games next month. He does such a great job at matching the menu to the show. I’m looking forward to seeing more shows this year especially Beauty and the Beast and Sister Act.